The proposed Private Members Bill would instruct the Minister of Municipal Affairs and Housing, in consultation with the Minister of the Environment, Conservation and Parks, to establish a Paris Galt Moraine Conservation Plan. This Bill largely applies and builds upon the framework that was developed for the Oak Ridges Moraine Conservation Act, which was written and passed by a Progressive Conservative government in 2001. The purpose of the Conservation Plan will be to provide land use planning direction to provincial ministries, municipalities, landowners, and other stakeholders on how to protect the moraine’s ecological and hydrological features for the benefit of present and future generations. The Plan will be developed in consultation with affected ministries, persons, municipalities, and Indigenous leaders, and will be reviewed every 10 years. Moraines perform critical ecological and hydrological functions that are vital for the well-being of our environment and communities. These landforms provide habitat for wildlife, maintain wetlands, streams and rivers, decrease flooding, and filter and store drinking water. The Paris Galt Moraine is an essential recharge, discharge, and storage area in the Grand River Watershed. In the moraine, rainwater is naturally filtered in underground aquifers and serves to replenish the groundwater system for drinking water. More than 800,000 people in towns along the Grand River watershed rely on moraine aquifers and groundwater for clean drinking water. Local moraines currently provide drinking water for nearly 200,000 people in the Guelph region. 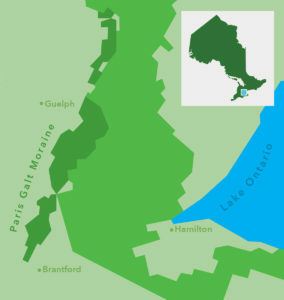 The region surrounding the Paris Galt Moraine (Brant County, Waterloo, Guelph-Wellington, and Dufferin and Simcoe) is expected to see dramatic growth over the next few decades, with an expected 1 million new residents by 2041. The increase of residents will inevitably place greater demands on the area’s groundwater system. This is problematic because the region, and especially the City of Guelph, is already experiencing water use restrictions. Increases in population and droughts caused by climate change will only exacerbate the situation. Furthermore, commercial and industrial demands are raising concerns in the area about the future quality and quantity of water available for the public, and the existing policies and laws are insufficient to adequately protect the ecological integrity of the moraine. The Paris Galt Moraine provides and purifies water at no cost to citizens. Establishing the conservation act is an opportunity to address water management concerns in a fiscally responsible manner now before the situation becomes dire. Failing to properly protect the moraine, and in turn preserve the region’s source of fresh water, will lead to massive investments in infrastructure to provide water for the region. Furthermore, local business, farmers and industry depend upon this water source for local jobs and prosperity. The Oak Ridges Moraine Conservation Plan has been effective in protecting the natural heritage of the area, modifying building practices to direct urban growth, and raising awareness about the significance of the moraine without limiting innovation and development in the region. The passing of the Paris Galt Moraine Act would achieve similar results and enshrine another key environmental policy into law in Ontario.